Concierge Service Cart from the Robert Henry Signature Collection by Touch America. The Body Bar is the Ultimate Body Treatment Machine! The Body Bar has two holsters that securely fit the Body Pod and a second Pod or Bowl of your choice. 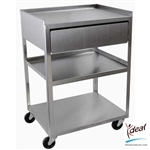 Features stainless steel pulls, locking castors, and two storage drawers. The Mini-Massage Bar offers all the functionality you need in a compact and highly mobile fashion. The Mini-Body Bar offers all the functionality you need in a compact and highly mobile fashion. 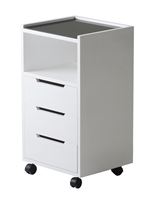 Features recessed pulls, locking castors, and two storage drawers. 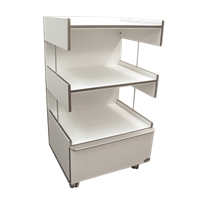 The SPA™ Service Cart is a patented cart/workstation that fits in almost any workspace. Constructed of lightweight stainless steel, it's not only easily portable, but also dependable, strong and sturdy. Versatile enough to be effective in a variety of applications, the design can be specially adapted for efficient, within-reach use by massage therapists, physical therapists, and body work practitioners. 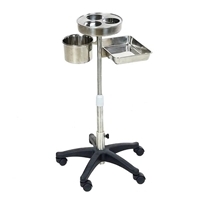 Includes two removable stainless steel trays and one "bucket" tray. 22"-37"H x 22"W.
The lightweight, portable Massage Pod combines FIVE separately controlled heating units into one sleek design! This simple and practical trolley fits perfectly into any work enviroment and adapts to your needs. Conceal your tools in the bottom drawer, and use the three (3) shelves to set up your accessories and supplies. 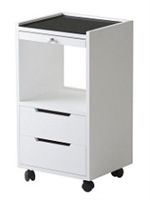 It is equipped with 4 quiet casters, making it easy to move and handle. 20"W x 35"H x 18"D. Top Shelf: 16" x 20". Drawer depth: 14.5", Distance between top shelf and middle shelf: 10.4". Distance between middle shelf and bottom shelf: 10.2". White Only.